This massive heat shield is covered in an ablative material that will help protect NASA's new Mars Science Laboratory rover Curiosity - a robot the size of a car - from the searing temperatures of atmospheric entry when it lands on Mars. Built by Lockheed Martin, the shield is 15 feet wide, the biggest ever bound for Mars. The largestheat shield ever built for a probe bound for Mars is ready for the new rover Curiosity,a massive Martian robot the size of a car. 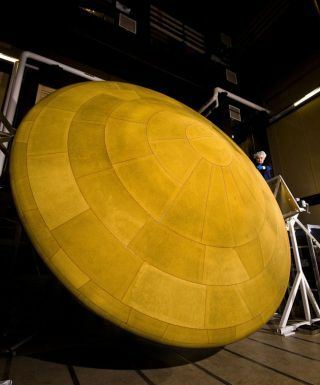 The immense heatshield will shroud the Mars Science Laboratory rover, now namedCuriosity, to protect it during its deep space cruise to Mars and the searingheat of entry into the Martian atmosphere. Lockheed Martin unveiled the heatshield this week and delivered its conical backshell to NASA last year. ?The Mars ScienceLaboratory aeroshell is the most complex capsule to fly to Mars,? said RichHund, program manager at Lockheed Martin Space Systems Co. ?The design had toaddress the large size and weight of the rover, the largest ever sent to Mars,and the requirement for landing at a more-precise point on Mars.? Curiosity?sheat shield and conical backshell are the largest ever built for flight. Togetherthey make up the rover?s 15-foot (4.5-meter) wide aero shell ? larger thanthose used with previous Marsrovers and even than the shell used for NASA?s Apollo spacecraft thatferried astronauts back from the moon. The Mars rovers Spirit and Opportunity wereprotected by shells measuring 8.5 feet (2.6 meters) and the Apollo capsule'sheat shield measured just under 13 feet (less than 4 meters). As therover, which is about the size of a small car, descends over the red planet thefriction it creates with the thin Martian atmosphere could create temperaturesup to 3,800 degrees Fahrenheit (2,100 degrees Celsius) on the outside of theshield. To withstand the heat, the shield is tiled with a material called a PhenolicImpregnated Carbon Ablator. This will be the first time the heat shield typehas flown on a Mars mission. Invented inNASA's Ames Research Center, the material first flew as the heat shield for theagency?s Stardust sample return capsule, which collected particles from a cometand returnedthem to Earth in 2006. NASA has anintricate landing sequence planned for the new Curiosity rover. After enteringthe Martian atmosphere, the rover will slow itself with a parachute andjettison its heat shield and back shell before beginning a powered descent withthrusters on a so-called "sky crane." The crane will lower the roverto the ground on cables and then fly itself off and crash. Curiosityis scheduled to launch in the fall of 2011 to broaden NASA's exploration ofMars and better understand the planet?s watery. The evidence the rover gathersmay help answer questions about life on Mars and the planet's habitability inthe past or present. The rover should also assess Mars' climate and geology inpreparation for human exploration.